"Noli me tangere," these are the words of the risen Christ to Mary Magdalene in the Latin Bible translation of John 20:17. Few expressions from the Bible have stimulated so much interest among artists and theologians alike as these three intriguing words. The "Noli me tangere" motif serves as the basis of an interdisciplinary research programme supported by the Fund for Scientific Research - Flanders, and entitled "Mary Magdalene and the Touching of Jesus: An Intra- and Interdisciplinary Investigation of the Interpretation of John 20:17 in Exegesis, Iconography and Pastoral Care." 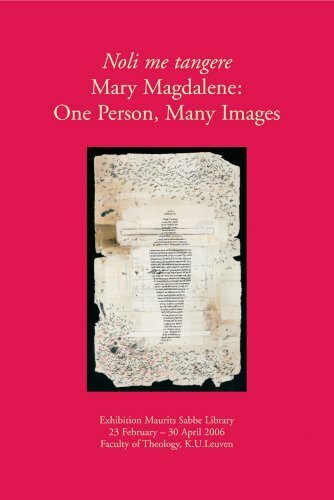 In cooperation with the Centre for Women's Studies Theology of the Faculty of Theology of the Katholieke Universiteit Leuven (Belgium), the research team organised an exhibition in the Maurits Sabbe Library under the title "Noli me tangere: Mary Magdalene: One Person, Many Images (Maria Magdalena in veelvoud)" (23 February to 30 April 2006). In the first part of the present volume, the four members of the research team , Sabine Van Den Eynde, Reimund Bieringer, Karlijn Demasure and Barbara Baert explore the significance of the "Noli me tangere" motif each from the perspective of their own particular discipline. The second part of the volume contains a catalogue of the exhibited works with a colour photograph and a short description. The artworks stem from a number of historical periods, running from the fifteenth to the twenty-first centuries. A variety of genres and artistic media are also represented in this exhibition: graphics, paintings, sculpture and miniatures side by side with devotional art. The research team also invited contemporary artists to contribute their interpretation of the "Noli me tangere" motif to the exhibition. The painting of the Indian artist Lucy D'Souza represents the fine line between Christianity and Hinduism. The photographer Malou Swinnen photographed a woman from the Philippines while the calligrapher Brody Neuenschwander created a sculpture covered with a veil of letters. The painter Claire Vanden Abbeele was found willing to make her already existing "Noli me tangere" available for the occasion. The exhibition thus combines artistic periods, artistic media and the various continents of the world. "Noli me tangere: Mary Magdalene: One Person, Many Images" hopes to provide a glimpse of Mary Magdalene that unites both past and present. The Noli Me Tangere motif serves as the basis of an interdisciplinary reseach programme supported by the Fund for Scientific Research. They put together an exhibition of which this book supports its findings.